"This is a fast read, very well-written, smooth, and the characters are enjoyable. The dialogue is very witty, and there is a lot of it, which really keeps things moving well." Dave Smart, Open University lecturer in business studies, is doing research for a new book, No 3 in the Doing Business on Other Planets series. The book covers the little-known North-West quadrant of the galaxy and centres on the Smiling Disc star system and its major planet, Kalista-mm. Accompanying Dave on his voyage of discovery are Daisy, Waldo and Ted, who all work in businesses of various kinds on Earth. Their specialist knowledge will help Dave interpret what he discovers during the trip. The Smiling Disc star system is 19 light-years from London Gatwick. Luckily, the Transgo Expressways service via Salutan, with its deep-freeze facility and use of metaspace loops, can get you there in a very manageable 19 years, one advantage of the freezing arrangements being that you don't age much in the process. The travellers take the shuttle from Salutan to the Kalista-mm port and go on by gas (as the Kalistan-mms call their atmosphere) to Lod-Ip, the capital of Champion. On the plane, Dave meets a Pradist priest who explains how the Smiling Disc and everything in existence was created. At Lod-Ip, the group is met by JR, their local guide and host, who takes them on an official visit to a sulphur mine. The Earthlings challenge the appalling conditions at the mine, both for its employees and the environment, and are shocked at how cavalier the locals are about their abuses. The travellers' next engagement is at the Nation 4 Academy of Science, Mathematics and Intellectual Elitism where they observe an experiment designed to confound the second law of thermodynamics. While at the Academy, Daisy and Ted become diverted and, being found in a large hangar with a secret Thadiwak nuclear missile, are arrested for espionage. After interrogation, Daisy and Ted are tried on a list of charges in a court presided over by a teenager. Following a cunning ruse by their lawyer, the Earthlings are freed and the group can proceed to their next stop, which is Nation 2, the Mountain Fortress. Daisy and Dave visit a beverage company and learn how alcohol is marketed and consumed, while Waldo and Ted are shown around a bank. The travellers discover that, while many of the business practices in the Mountain Fortress are immoral, reprehensible and probably illegal, they're not that different from those at home. Their business visits complete, the travellers take the hopper up to Kalista-mm's satellite, the Mooon, for some rest and recreation before their long trip back to Earth. From the Mooon, a playground of vice frequented by revellers from the main planet, the Earthlings can observe Kalista-mm and are horrified to witness the start of a nuclear war which has broken out over sulphur, the planet's sole source of energy. Waldo has fallen for a local woman in a raunchy nut-bar. He has been offered a job at the Kalistan-mm bank and now has two reasons to stay in the Smiling Disc star system. But the place is being blown to smithereens before his eyes. His new love drinks sulphuric acid and lays eggs; how would she go down in Docklands? Will he stay or will he go? Available as an e-book, a 208-page paperback and an audiobook. 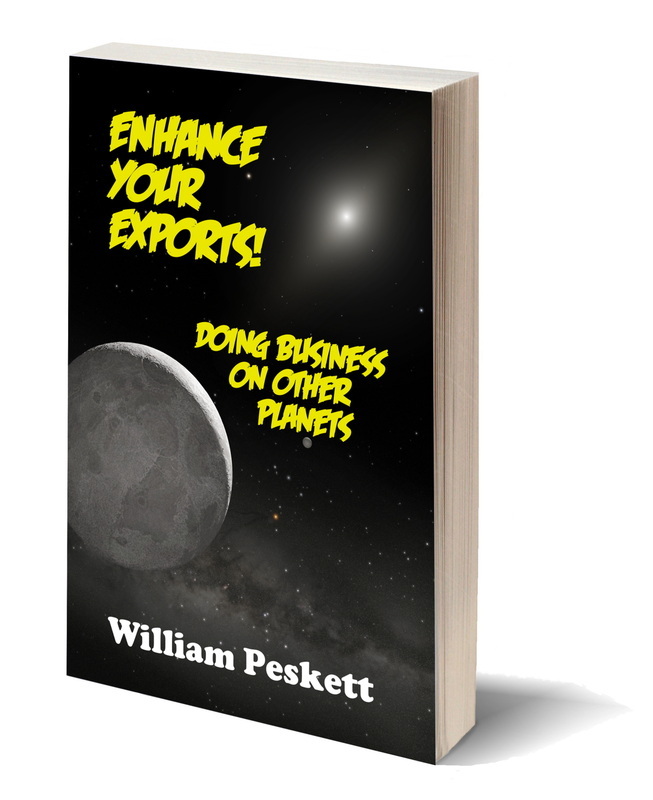 In 2014 I adapted Enhance Your Exports! as a radio comedy retitled Deals in Space! You can read the script here.